It’s Time to Talk About Backups Again | by Drew Bennet – WELCOME TO OUR INTERNATIONAL SUPPORT! Every so often we write about making backups and why it’s a good idea to backup at least once a day. I would venture to say it’s the number one rule in our support department. Try as we may to get everyone in the habit, someone always calls with a serious situation where the database is corrupt or gone and there’s no recent backup in sight. Let’s face it; you don’t have a good habit of making backups. In fact, when you began reading this article you thought back to the last time you made a backup and you can’t remember, can you? It’s OK. I’ve been there, too. Today, I’m going to share some horror stories with you and then I’m going to give you some great ideas to apply when it’s time to protect your database. My first experience with a catastrophic loss of data happened way back in 2008. A client called me to tell me she lost a PC in a power outage at the station. She managed to install MusicMaster on a laptop but the only backup she could find was from 2005 when the station signed on for the first time. She spent hours importing music, recoding songs, building clocks and reconciling music logs from her automation system. A client once called me to tell me a disgruntled ex-employee restored the only backup the station had on record before he left. That backup and restore cost the station two years of data and many hours rebuilding clocks, libraries and logs. Just last week a client called to tell me an intern mistakenly deleted the database from a network folder as a part of a cleanup task. They had a backup from six months ago but nothing more recent. That client spent the rest of the evening rebuilding six months of work. Accidents happen. PC’s get viruses, interns delete folders and lightning (or some other natural disaster) might even strike the station. If you have a backup on hand, you’ll live stress free from these issues that result in a major loss of time, work and money. The good news is it is easy to make a backup. Head to Tools, Backup and choose to Perform a Standard Backup. This places a copy of your database in a zip file and places the zip file in the same folder as your database file. Other online alternatives include a folder on your company’s network that is backed up nightly by IT, a network storage device (NAS), or an FTP server. Flash Drive – This is the most popular way to store your data offline. Flash Drives are portable, have no moving parts and they can hold tons of files. Consider this the answer to floppy disks from your ancient DOS days. CD/DVD – Burning your data to disk is one of the best ways to store it offline. Make one of these per month and you will never worry about losing large amounts of data even under the worst circumstances. Keep a small library of these over the year. Re-use the CD/DVD when the backups are no longer needed. SD Cards – If your PC or laptop has an SD Card connection or you have an SD to USB adapter, you can use SD Cards to hold your database files offline. The most common usage of SD Cards is to hold your photos but SD Cards can be used for a variety of storage needs and backups is one of them. External Hard Drive – Some users prefer to keep a larger device on hand in order to store database files and a whole lot more. If you have big offline storage needs and your MusicMaster backup is just one of the items on the list, consider an external hard drive. 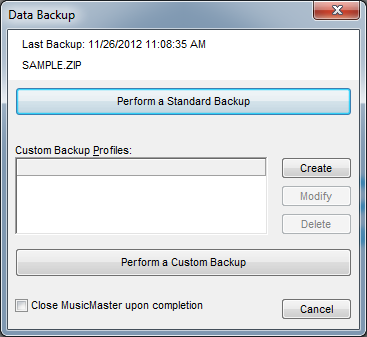 Most of these backup solutions, online or offline, can be setup in MusicMaster using Custom Backup Profiles. To create a custom backup, head to Tools, Backup. In the screen that appears you will see a button labeled, “Create.” Click that button and that brings you to the main backup profile screen. Here you will name your custom backup profile at the top. There are various settings you can adjusting, the most important two being the Backup Filename and Additional Files. To set the backup path, click the Backup Filename field and choose the grey box at the end of the line. This opens a file selection box where you can surf to the location where the backup should be saved. Once you have surfed to that location, choose Open. 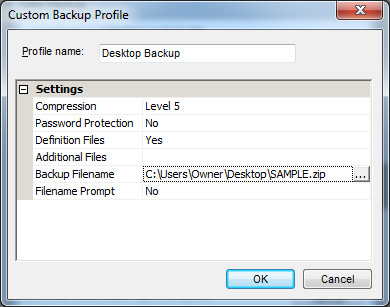 That sets the path in your custom backup profile. Additional Files is important if you use features like Reconciliation or Library Synchronization. Those features require extra files to work. You can specify those files here so your backup will contain all the files you need to continue working seamlessly. Once you’ve adjusted all the Settings, you are ready to hit OK. Now you’re back to the main backup screen with your new profile in view. Highlight that profile and choose Perform a Custom Backup. Your data is backed up to your online or offline location and you’ve just saved yourself a lot of heartache! The key now is to get in a good habit of doing it every day.